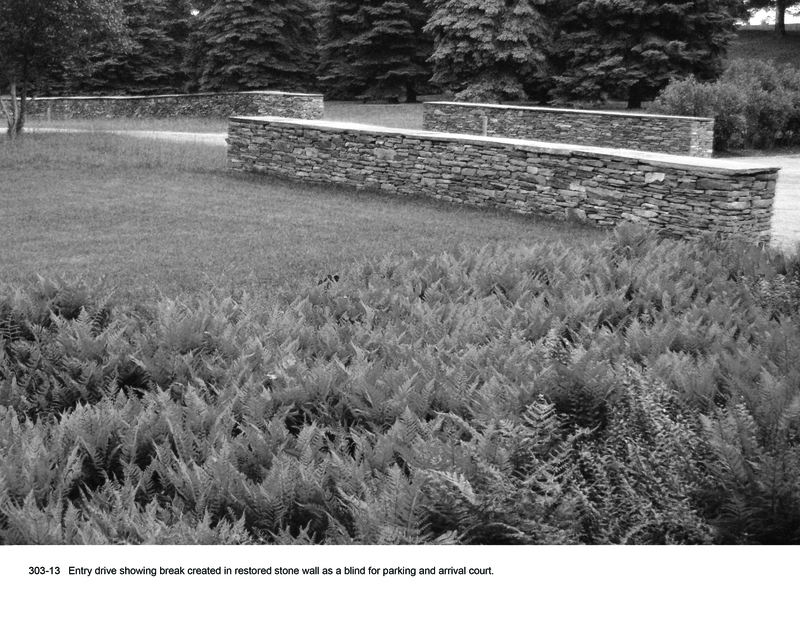 Photo: Michael Vergason Landscape Architects, Ltd.
View up entry lane with restored dry-laid walls. Nighttime view of house from entry drive. 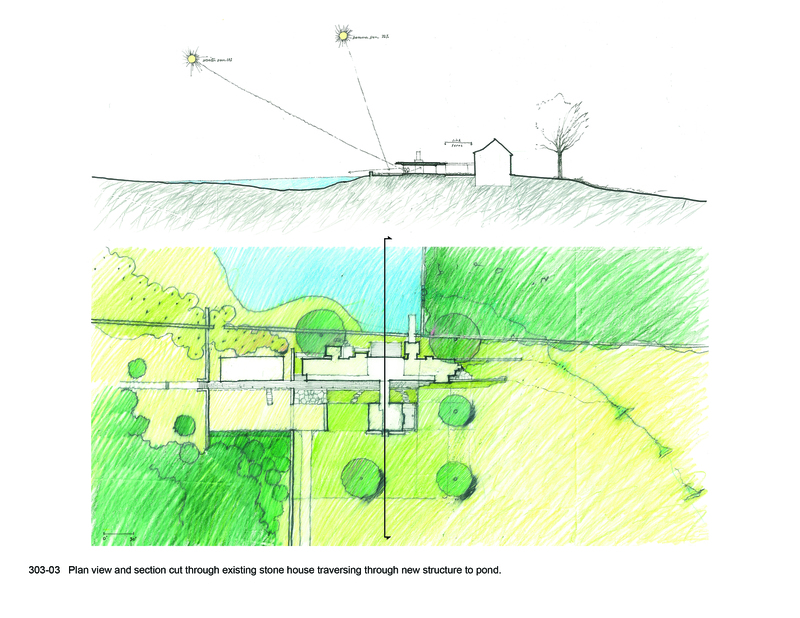 Plan view and section cut through existing stone house traversing through new structure to pond. House presses close to pond at existing stone wall. Morning view looking north across new pond. Reflected light of pond brings new life to the site. 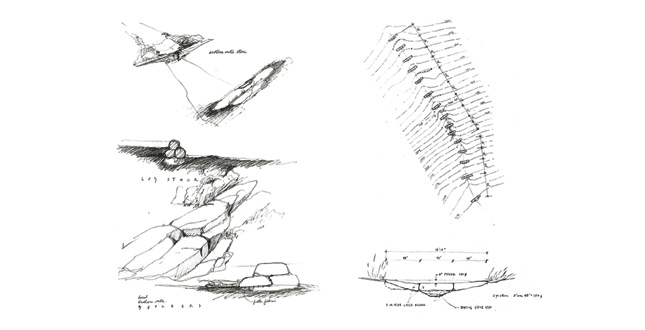 Sketchbook studies for stone step pools. Controlled-release weir of pond adjacent to cantilevered wooden dock. Courtyard view shows bluestone porch floor transition to gravel drip edge to flagstone pavers. 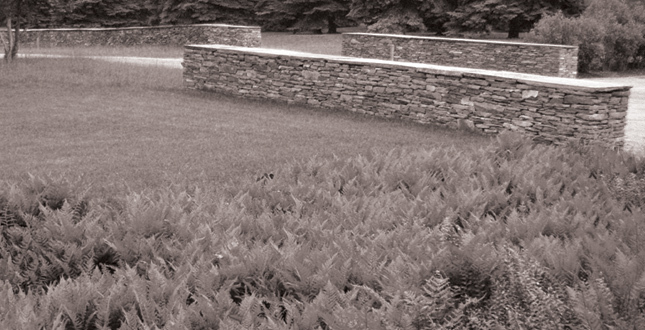 Simple fern beds aid infiltration and connect landscape through glass link. Guest parking area in foreground. Fern beds on opposite side of glass link. Distinction between inside and outside becomes blurred through play of materials and planting. Entry drive showing break created in restored stone wall as a blind for parking and arrival court. New dry-laid retaining walls extend vocabulary of stone site walls to reveal lower level of house. The existing wet woodland lies to the right in photograph. Strong linear geometry of wall extends into the landscape. 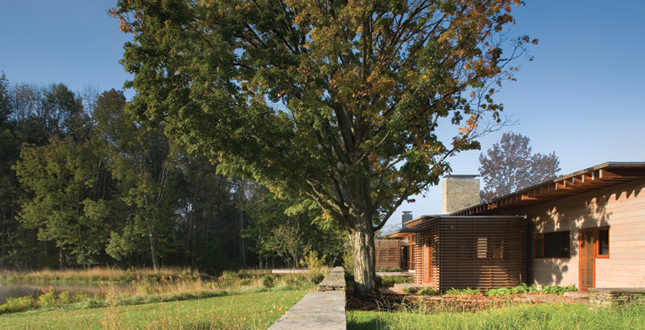 Set within the geologic folds of the ridge and valley landscape of northeastern Pennsylvania, the Lily Lake Residence enhances the rural landscape with a series of deliberate yet restrained landscape interventions. Building upon the existing linear framework of dry-laid walls, the project integrates old and new with a potent result. 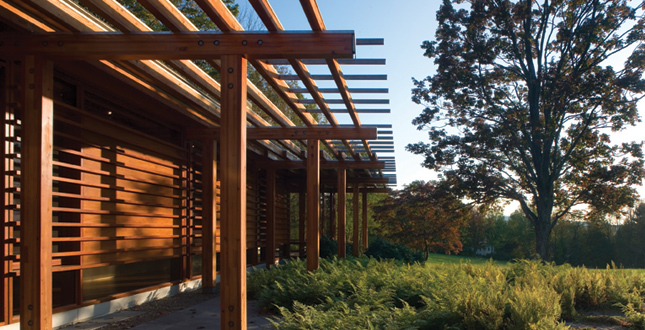 Water and plantings weave through the creases of the woodlot terrain improving the site's drainage and redefining the life of the site. 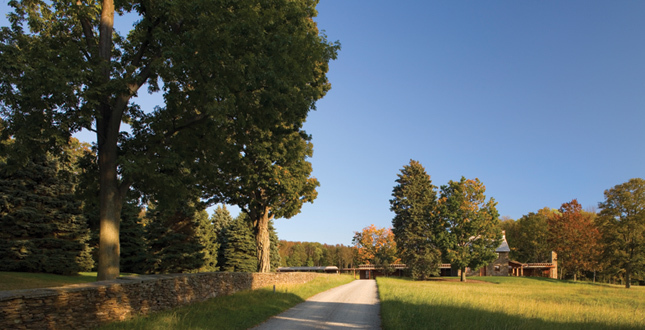 The agrarian character of the existing 88-acre site is seen in the rolling hills, meadows, woodlots, and hedgerows metered by a series of dry-laid stone walls. 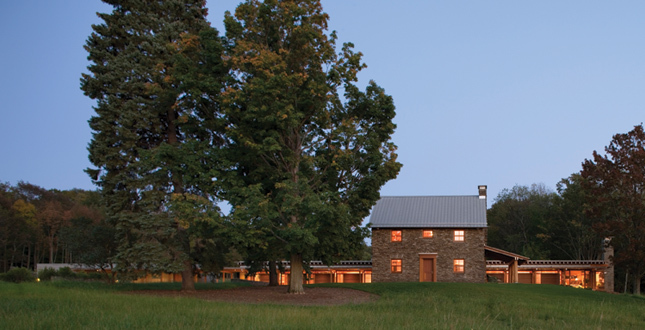 When the client purchased the property, there were two houses on the property: a modest stone house built in the 1800s in the lowland and on the hilltop, a 1970s colonial which was out of character with the agrarian language of the site. 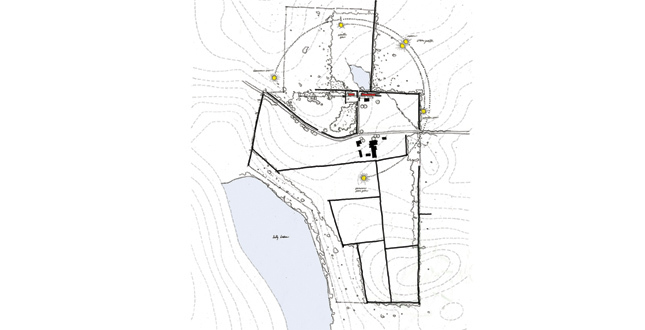 Water and erosion issues permeated the site illustrated most clearly by a saturated agricultural field adjacent to the stone house. 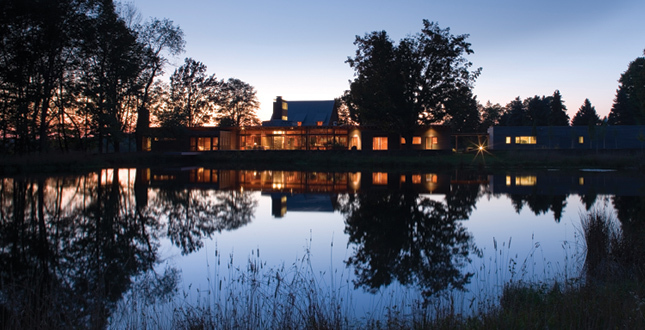 The client wished to create a family retreat that captured the beauty and solace of their agrarian setting. 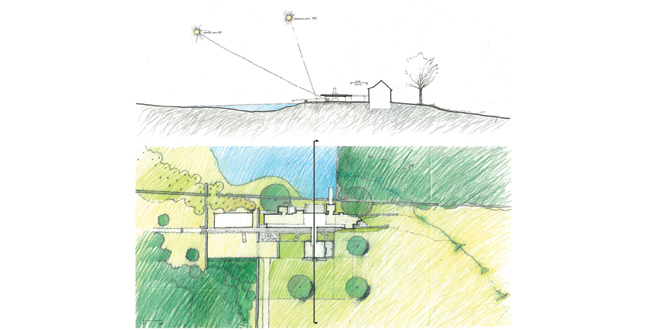 The client originally imagined a home sited on the hilltop with views beyond. 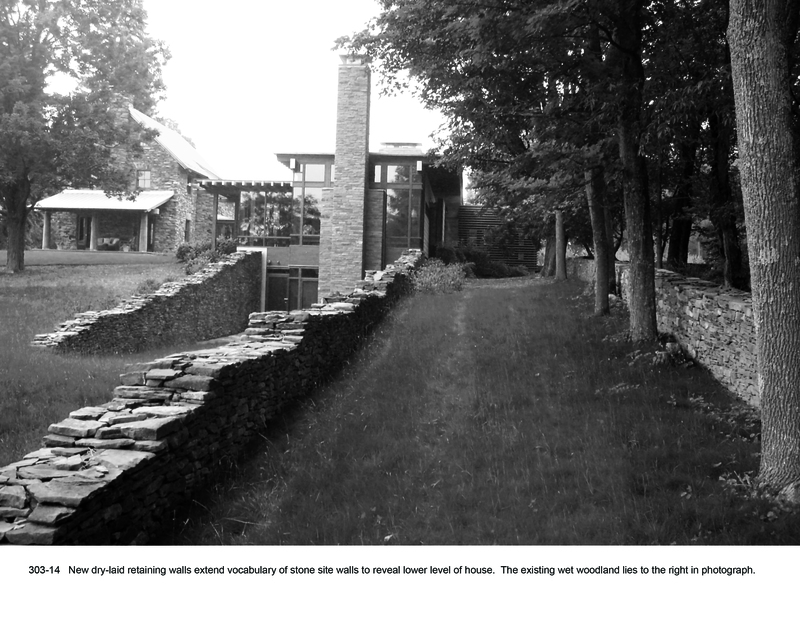 Upon site evaluation, the architect and landscape architect recognized significant assets in locating the house in the lowland inserted between the historic stone house and an existing stone wall. 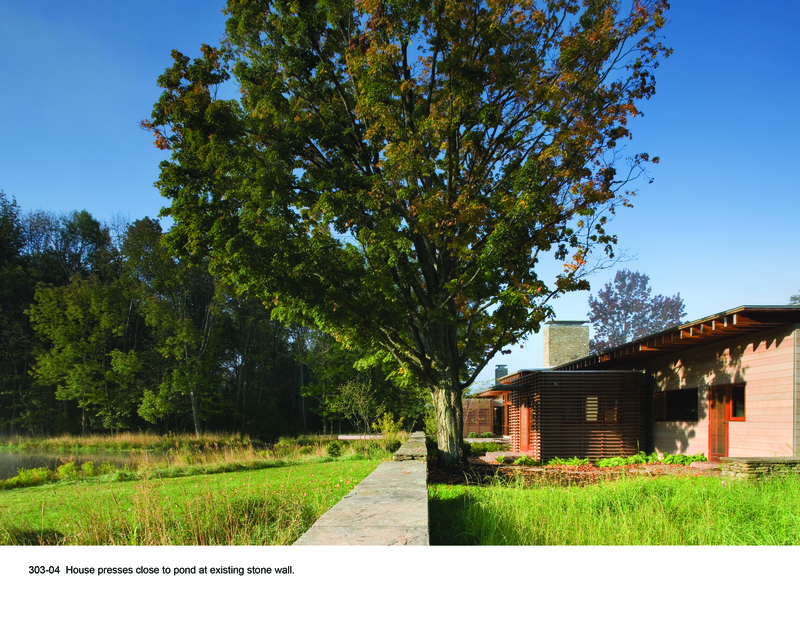 The assets of this lowland site offset the more predictable hilltop location and offered a series of design opportunities within the shade of the site's existing mature trees. 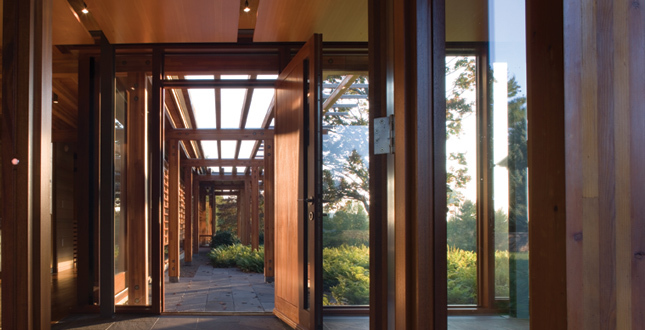 The new portion of the house, a linear wood structure, contains the primary living quarters of the residence and is tied back to the stone house with a delicate glass passage. 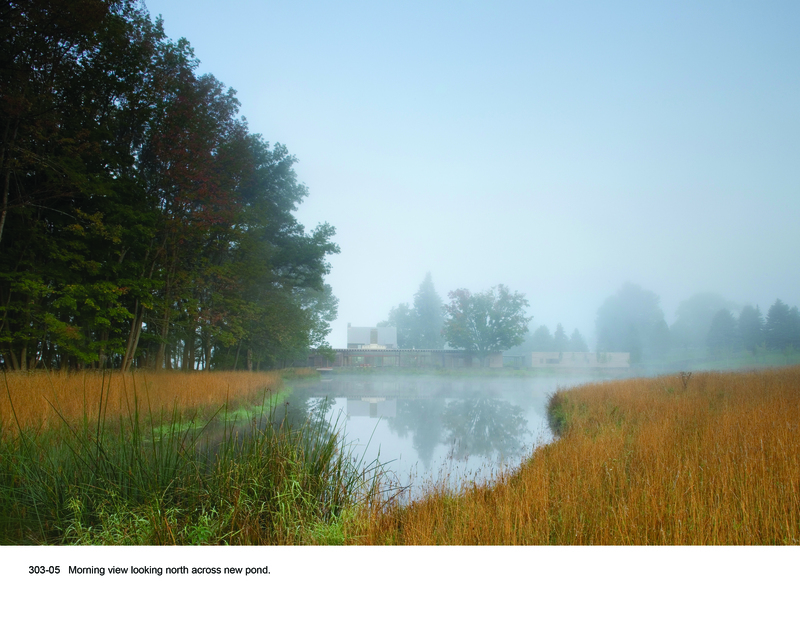 Rather than have the new house pressed close to a damp field, the landscape architect saw an opportunity to transform the field into a pond, creating a poignant and environmentally active setting for the new house. The 1970s house on the hill was cleared for a memorial grove at the highest point on the property. 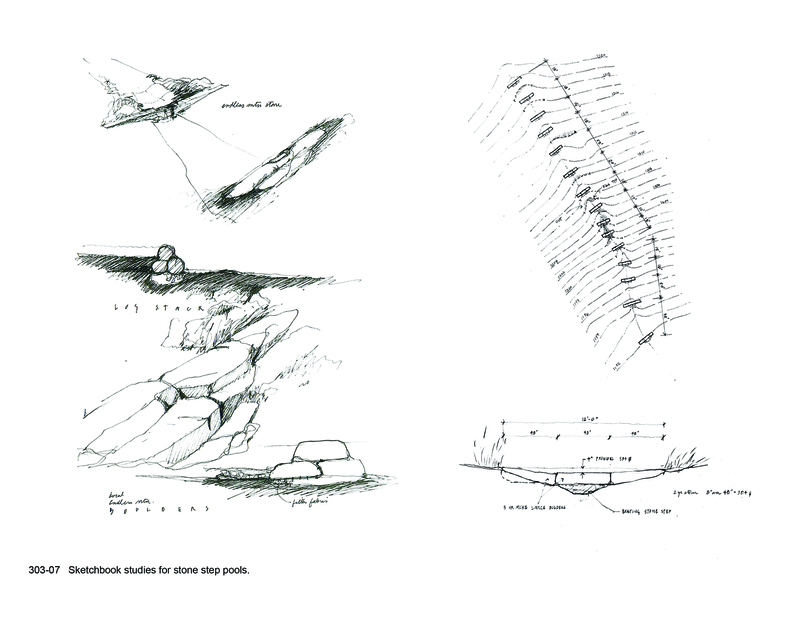 In the site analysis, the landscape architect identified a wooded wetland across the wall and speculated that the saturated field had at one time been a wetland. During the construction of the new pond, the contractor discovered evidence that the area had been filled and drained using drainage tiles. 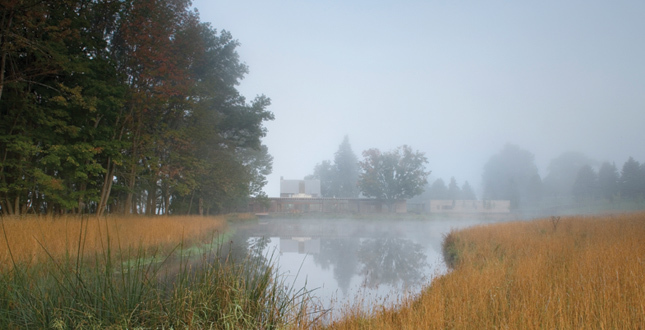 The design of the pond enabled the landscape architect to restore grades and recall some of the natural conditions of the site by expanding plant diversity and wildlife habitat. Creating a pond from a groundwater seep was a perfect answer to the water-flow issues on the site and also gave the family a new frontage for the south side of the house. Throughout the seasons, the water expands the views and draws in the warm reflected light, particularly in the cooler months when light is so precious. It registers the variability of the site's temporal conditions of the wind and sun in ways that bring new life to the entire property. 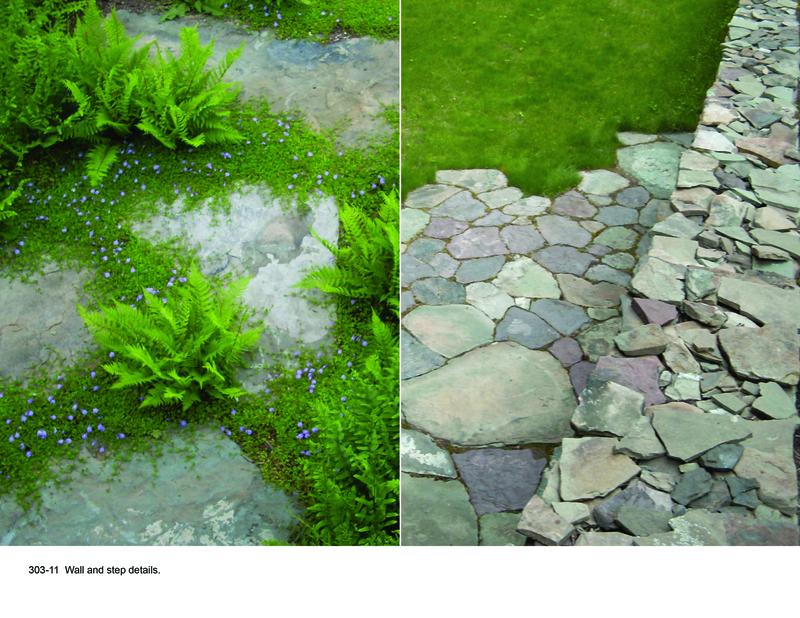 The landscape architect improved site erosion and water-flow issues with a series of stone step pools. 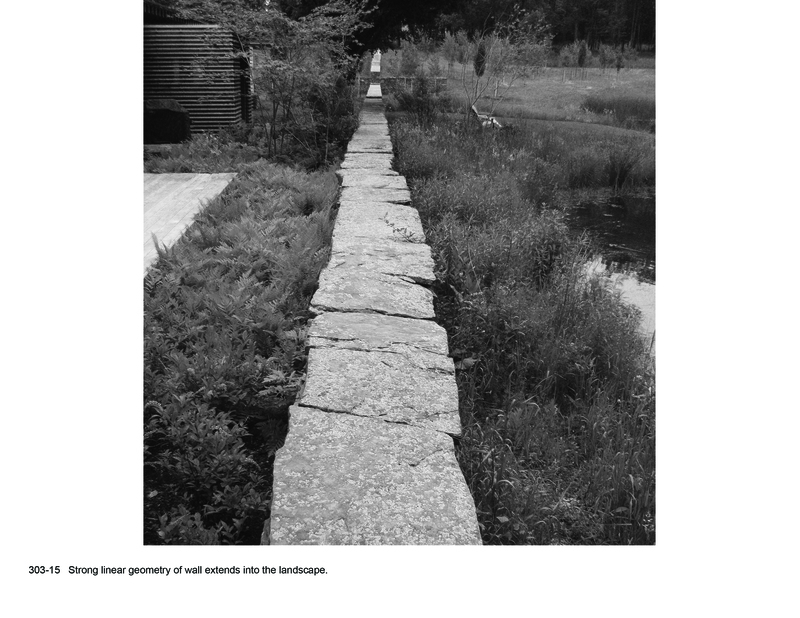 The step pools, made with stone dug on site, control the overflow from the pond and move it through a field next to the house. Placed within the existing drainage flow line in the field, these walls help to reduce water velocity and continual site erosion and at the same time protect the larger watershed. In an effort to maximize the project's stormwater infiltration, rainwater is directed from the gutterless roofs of the new addition to a gravel rain strip surrounding the house. This gravel strip filters the water feeding the pond on the south side and the planting beds on the north side. The soft planting edge is dominated by a mix of ferns, designed to weave in and out of view from inside and outside the house. 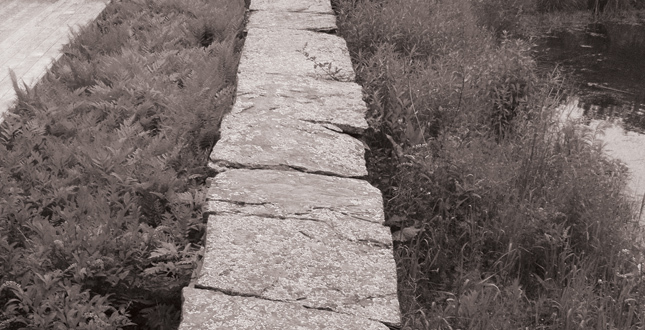 The planting creeps between the open joints of the local fieldstone paving, allowing the maximum amount of infiltration. 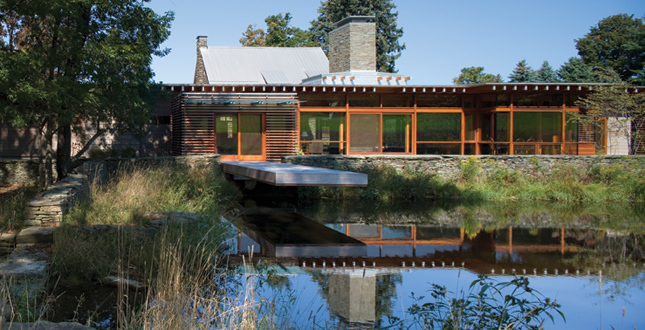 The new addition with its timber milled structure and glass walls tying inside and outside sits in direct contrast to the solidity of the stone house. 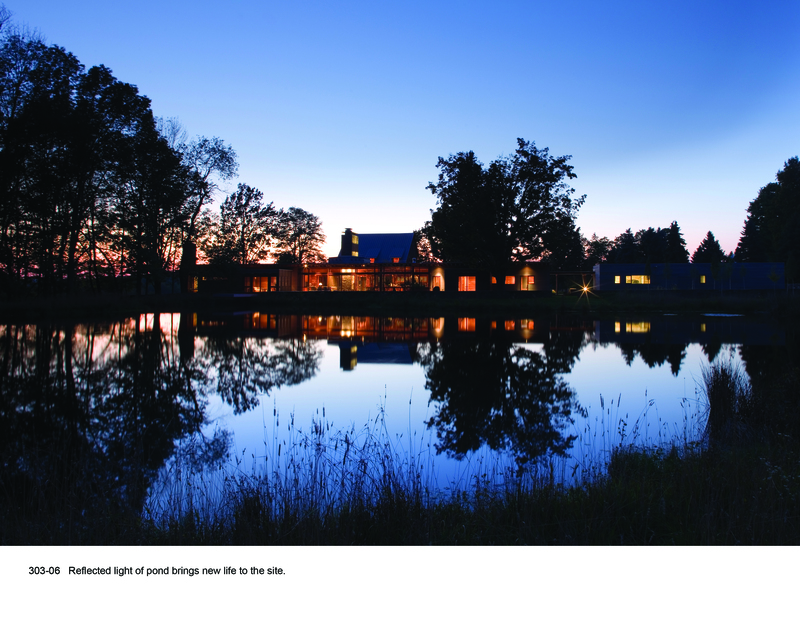 The design develops a strong connection with the long views of the property, drawing the reflected light from the new pond and surrounding fields. 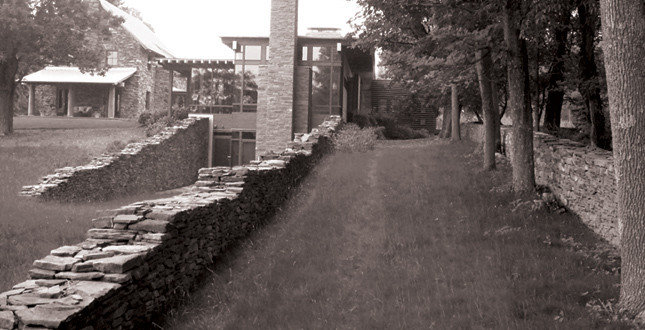 The landscape architect designed new stone retaining walls to expand and frame the views from the interior by exposing the lower level of the new house on the western end. 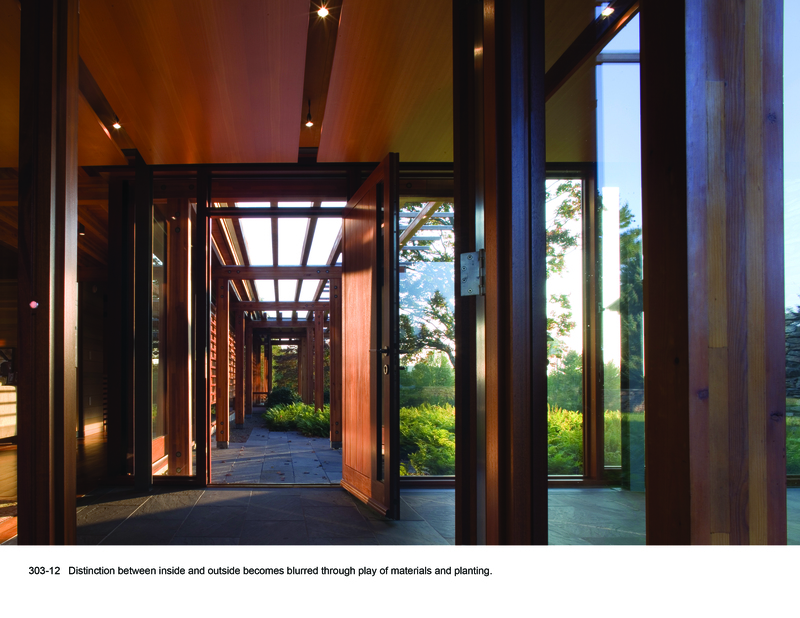 In addition, the landscape architect worked closely with the Architect on the choice of materials to support the connections from the interior to the exterior. 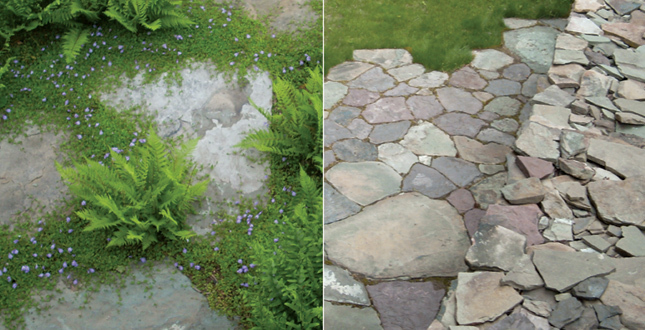 This is shown in how the building floor of locally quarried bluestone continues seamlessly from the interior, to the porch, and on to the courtyard with fieldstone paving excavated from site. 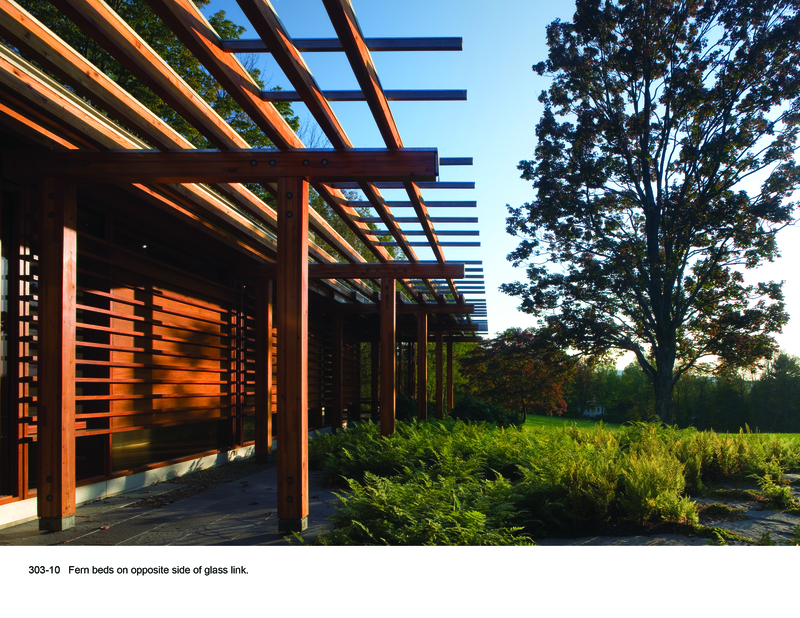 The predominantly native plant palette builds on the materials of the area with restraint and simplicity. 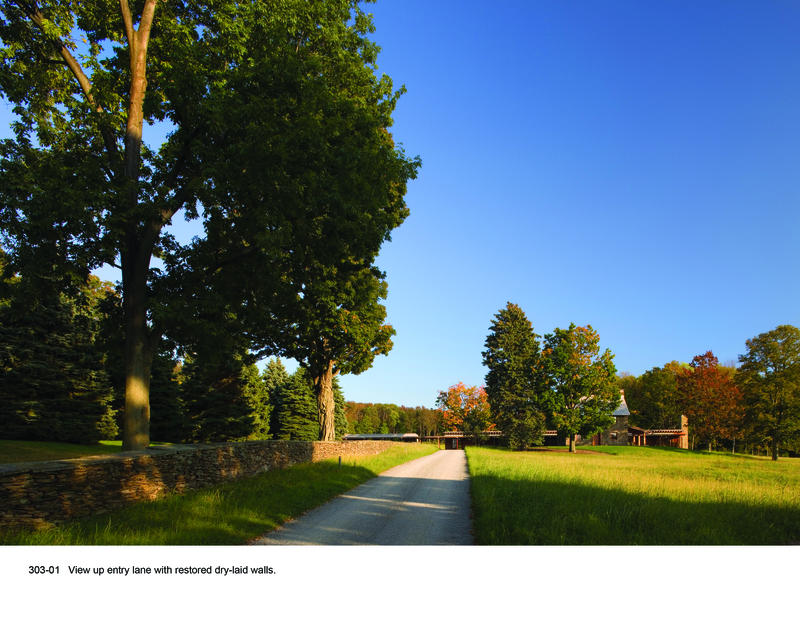 The landscape architect sought to save existing trees on the site, recognizing that much of the site character depended upon preserving these large specimens. Rich beds of deciduous and evergreen ferns distill the dominance found in the understory of the site's woodland. 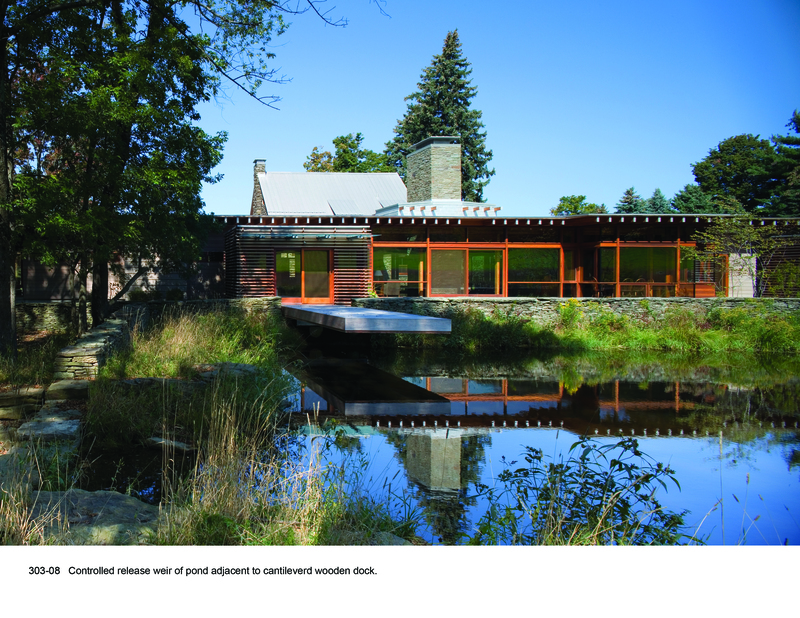 More complexity is found in the rich edges of the design around the pond and expansive fingers of woodland along the stone walls. The new trees at the existing wall along the pond tie back to the existing woodlots. Aspens were chosen for their fall color, fast growth and scale as a pioneer tree in the early successional forest. 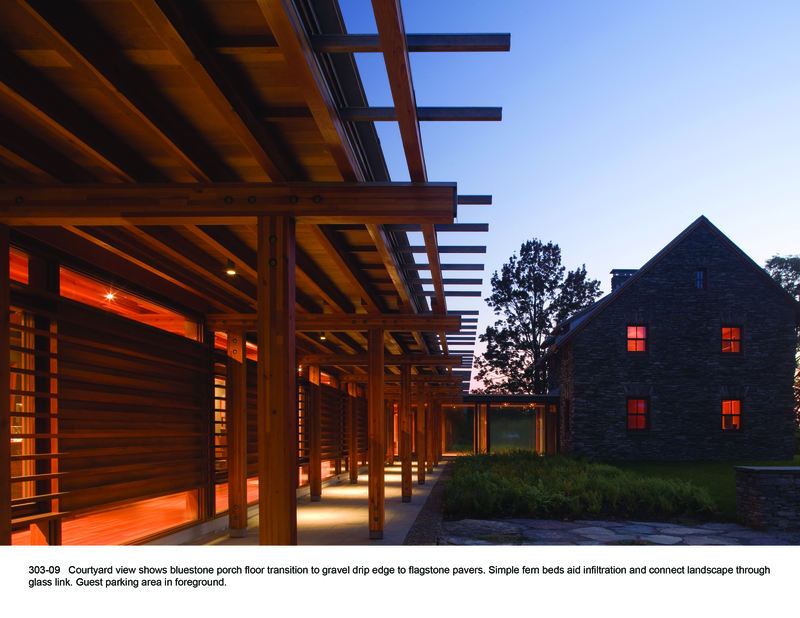 The landscape architect improved the arrival sequence and better articulated views to and from the house using the vocabulary of the site's dry-laid stone walls. By subtracting a section of an existing wall, and building a parallel section, walls frame the arrival court and driveway. The new section of wall creates a blind: shielding the view of the cars from the house and breaking up the geometry of the courtyard. New walls are quietly inserted throughout the design in ways that make them hard to distinguish from the existing walls on the site. All the stone for the walls, fieldstone paving, and stepping-stones was excavated from the disturbed portions of the site. 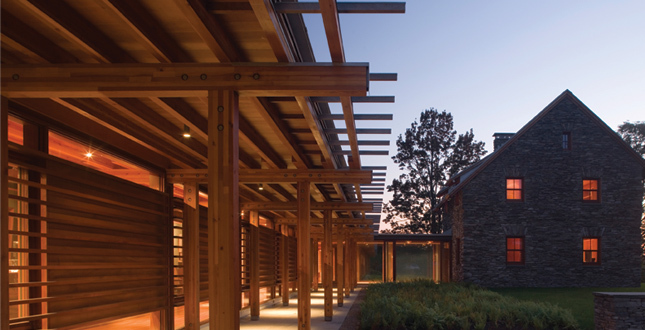 Throughout the design process, the landscape architect worked closely with the client and architect to develop details and construction strategies derived from the local craftsmen and building traditions of the area. The result is a project that has a beautiful restraint, a distilled quality to the design choices that brings new life to old traditions. 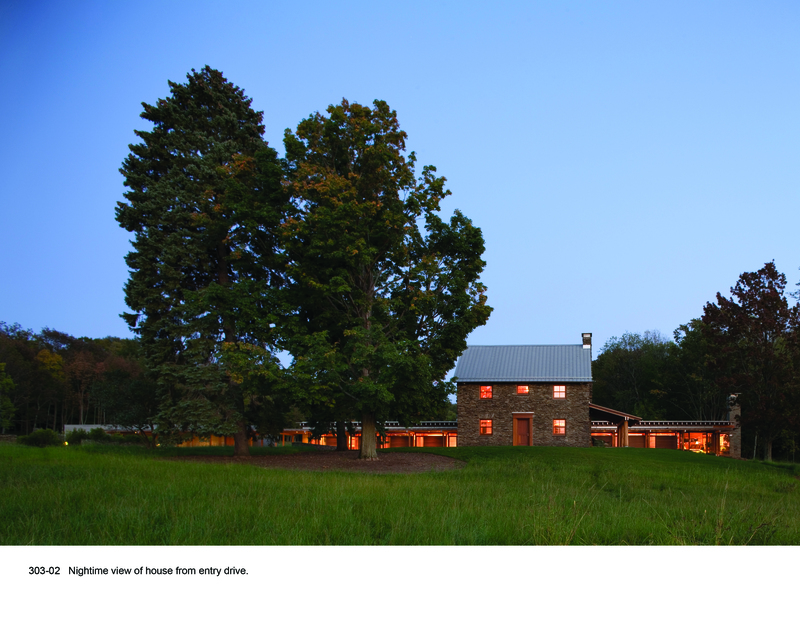 This project amplifies the agrarian setting in a way that beautifully highlights the carefully articulated and refined details of the house construction in a fully integrated, fresh result. Michael Vergason Landscape Architects, Ltd.
Joseph Kalinosky, Kalinosky Landscaping, Inc.